I'm not a fan of the disco sketch, but I like it when Kermit and Gene dance together. I absolutely LOVED this teaser trailer because it did exactly what it was supposed to do- excite us all die-hard muppet fans and entertain and tease all of us for what's to come. I had the amazing opportunity to spend a day at the London movie sets and because of that it is killing me because I know some of the answers to the questions people are asking on here but I can't answer them- all I can say is that the movie is going to be amazing, will have a lot of great GMC-like moments, and the team really took it to heart when people voiced their concerns about classic characters- because of scene designs, plot constructs, limited time and limited performer bandwith, they couldn't get everyone that we liked on for significant screen time but from what I saw there is a MAJOR improvement on this front and props to them for that. The cast was super excited and enthusiastic about the movie when I was there and the trailer definitely shows some of that. The trailer did a great job highlighting a lot of cameos, which will get some not as die hard Muppet fans intrigued about the movie, hoping to see their favorite celebrity. I also loved the whole Scooter bit, because it's a great pop culture reference and homage on how the Muppets can do a pop culture spoof like nobody else can and the amazing results because of it! I wished we saw more of Miss Piggy but she does feature prominently in the plot so hopefully we will see more of her in other trailers. They did a good job at showing a lot of spots where people had to question on whether it was Kermit or Constantine and at first glance I have to admit I was fooled a few places at first. I also think the puppets overall are so vibrant and gorgeous and I LOVE the whole big production number (can't wait to see what it's for and how it plays into the plot). A lot of the basic movie elements such as picture quality look fantastic, I mean really fantastic. So excited to see more- it's going to drive me crazy to wait until March of next year to see this but from everything that I have seen it's going to be a Muppet movie for the recordbooks-definitely one that fans and non-fans alike will talk about. CAN'T WAIT TO SEE MORE!!!!! LouisTheOtter, Muppet fan 123, DrDientes and 4 others like this. Here's a SharkWeek inspired addition of MuppetTrailerShorts created by me. Get these Muppet-loving sharks off this Muppet-loving train! im going to make this my ring tone on my phone ! Isn't that Kermit(?) under the fella with the beard's (for all intents and purposes I would like to refer to him as "Mr Beardy") arm?? Put. The frog. Down. Best movie quote in the entire world. Thought the scene makes me wonder how Kermit survives in such cold weather without clothes. I mean, the other people are wearing heavy clothes. I personally find the Kermit and Animal pairing not so good, though. Muppet Wiki article on Constantine. Where did they get the info, anyway? LaRanaRene and Mo Frackle like this. Though the scene makes me wonder how Kermit survives in such cold weather without clothes. I mean, the other people are wearing heavy clothes. It's Muppet logic/not supposed to be taken seriously. I was actually referring to Uncle Deadly... But yes! Gonzo having decent screen time would be great! Oh I would love that, Walter. Gonzo's my faaaaaavorite! I know he's a weirdo or a whatever, but I love him to have decent screen time. : Well, it's about time, because I would like to do a new stunt I have never done. Me - Gonzo, maybe it would be nice if you can look for Camilla. Me - Rest to assure you guys that he will find his Camilla. I love Scooter singing "Moves Like Jagger" because it really shows one of the things that the Muppets have always done best, sing their own renditions of Popular Songs! Muppet fan 123 and ploobis like this. 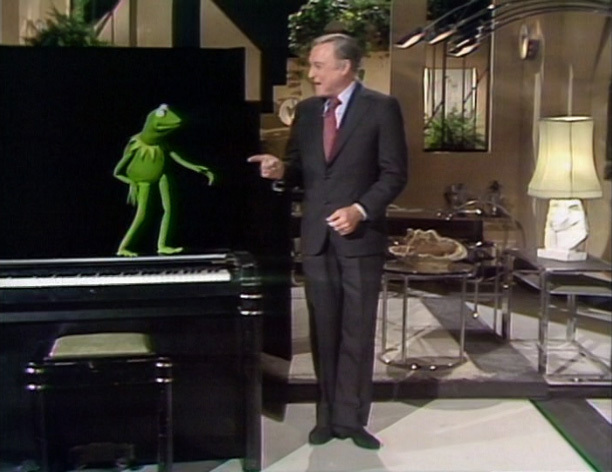 Don't forget the songs the Muppets also did on The Jim Henson Hour and Muppets Tonight. Muppet fan 123 and RainbowConnectd like this. I dont know whats going on here with Pepe and Sean... but i can't wait to find out!!!!!! 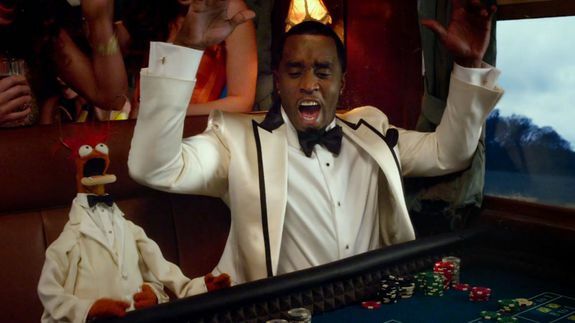 "Travelling on a train, (Silvana Lovin) plays the dice game craps with (Pepe and P. Diddy), then dances with Pepe and ends up in a tussle with another girl while vying for the prawn’s affections." Ha ha! Oh but of course! How silly of me... Who wouldn't want Pepes affection? You know, when I hear songs from before 1981, I tend to think they'd be good on The Muppet Show. 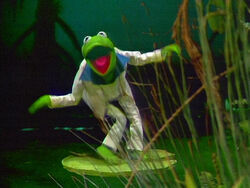 And when I hear songs from the 1980s, I tend to think they'd have been good on The Jim Henson Hour. But hearing 1990s songs doesn't give me that effect regarding Muppets Tonight. You could also say that The Muppets was dated the moment it was released because they sing Smells Like Teen Spirit, a song from the early 1990s (and I read somewhere that pointed out Moves Like Jagger is from 2011, wouldn't that already date this picture?). Thought the scene makes me wonder how Kermit survives in such cold weather without clothes. I mean, the other people are wearing heavy clothes. Although Kermit often wears winter clothes in winter weather, he has also at times not worn extra clothes while outdoors in the winter, and whether he freezes seems to very. In the Gladys Knight episode, when it snows at the end Kermit remarks that he's got a thermal collar on. I saw Scooter dancing 'Moves Like Jagger' in a diner with the penguins....I was like, "Oh god, that's embarassing........."
Actually, that's now considered a rock classic. Dated would be if they performed anything by MC Hammer. It looks like its going to be another muppet classic !! Im so excited for this new movie ! Wish it was more soon! Ill be counting down until then!